The Society presently consists of approximately one hundred-fifty members, most of whom reside in the Greater Boston area. Two business meetings are held each year, a semiannual spring gathering, and the annual meeting in the fall. Additionally, other social meetings, highlighted by a yearly Christmas Luncheon, are held. Also, the Society in accord with its By-Laws, and in cooperation with other similar organizations such as the Civil War Committee of the Union Club of Boston and Civil War Roundtable, participates in joint meetings. "The 28th Mass. Volunteer Infantry (Irish Brigade) in the Civil War"
"The Siege of Fortress Louisburg - 1745"
"King Phillip's War in New England - 1675"
"Massachusetts Women in the Civil War"
The Military Historical Society of Massachusetts' early chronicle is entwined with the life of John Codman Ropes (1836-1899). The son of a Boston merchant, Ropes graduated from Harvard College and Harvard Law School where he was selected as the first editor of the Harvard Law Review. 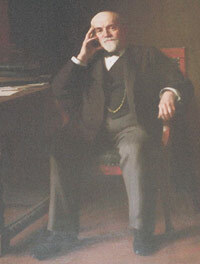 In 1865 he formed a partnership with John C. Gray. Today the law firm of Ropes and Gray is one of the largest and best-known international practices in the world. A physical disability kept Ropes from serving in the armed forces during the American Civil War. Instead, he became an authority, writing several books about a conflict that took the life of his brother Henry, at Gettysburg. His studies stimulated, along with the support of twelve former Union officers, the formation of the Military Historical Society of Massachusetts on February 7, 1876. Today, the MHSM is the oldest such Society in America and continues to uphold its founding purpose, to investigate questions of military significance with the sole aim for "nothing save the ascertainment of the truth." The author of numerous articles on the American Civil War and warfare under Napoleon Bonaparte, Ropes' first book "The Army Under Pope" (1881) led to the exoneration and reinstatement to the U.S. Army of Major General Fitz John Porter and illuminated the muddled fields of blame that shrouded the events of the Seven Days Battles of 1862. The work was to be a preamble to his magnum opus. Written with William Roscoe Livermore, the four volume "The Story of the Civil War: A Concise Account of the War in the United States of America Between 1861-1865" (1894-1913) was widely heralded as a significant tome on the war. Sadly, Ropes would not live to see the final volume published. "The First Napoleon: A Sketch, Political and Military" (1885), "The Campaign at Waterloo: A Military History" (1892) and "An Atlas to the Campaign of Waterloo" (1893) added significant insights to the inner workings Napoleon's political and military command structure. Ropes' interest in the "Little Corporal" led to the acquisition of a 400-book library, and many priceless artifacts from that era, including Napoleon's death mask, and a saber believed to have been owned by the famed Marshal Joaquin Murat. By 1891, when the Society incorporated as a nonprofit educational organization, membership had grown to 146 members, including numerous American military luminaries. In 1896 Col. Thomas Edmands, coaxed Ropes into placing his voluminous Napoleonic and American Civil War library in the MHSM Rooms at the new First Corps of Cadets Armory in Boston. Bolstered by gifts, Ropes' research, and papers debated at Society meetings, the library grew to more than five thousand volumes, prints of Napoleonic satire, newspapers, photographs, lithographs, artifacts and maps. In 1969, after the sale of the Cadet Armory, the collection was placed on permanent loan at Boston University's Howard Gotlieb Archival Research Center where the collection is exhibited and made available to the public and scholars from around the world. The MHSM continues to push for the ascertainment of "truth" though our lecture series, annual ROTC essay contest, selected grants, donations, scholarships, and battlefield preservation.